There was a local 3 mile race taking part in a nearby village and myself and my brother in law decided to give it go. I went for 3 training runs before the race and won it with my brother in law coming 2nd. I then heard about a running group that the council had set up trying to get the community active so went along. This is where my enjoyment of running through the woods started at the age of 35 and Moray Roadrunners were formed. No, I just enjoyed the company and started to enjoy the improvement of my own running. The feeling of fitness, racing and the camaraderie of other runners and supporters. I then started coaching juniors and this helped improve my own performances and gave a great sense of satisfaction. My most memorable best performances are winning 3 British Track Masters Golds in MV50 one weekend in July 2000 in Bedford. The first gold came in the Saturday in the 1500m in a time of 4.27 followed by the 5k in 16.20. Then the 10,000m on the Sunday winning in 33.18. Also in 28 degrees in Riccione Italy, in the World Vets Track in September 2007, I was 5th in the MV55 5k in a time of 16.57, 4 days after I took the Silver medal in the 10,000m in a time of 35.10. All my Scottish and British Masters X Country medals but always behind Mike Hager (England). I was also pleased that in September 2006 at the age of 56 I ran 33.37 in the Dyke 10k and a week later did 75.44 in the Great North run. I cannot remember ever having a really bad race. I only get out of the racing what I have put into the training. I don’t really have any. I just want to be able to keep running and remain injury free. I thoroughly enjoy my golf now that I have retired, trying to reduce my handicap which is currently 16. I also enjoy a bit of coaching, travelling and gardening. Lots of lasting friendships, fitness and enjoying watching friends/athletes in various competitions. Sunday – steady 14-16 miles. Nowadays I’m happy if I can get out and just run! Injury has prevented me from proper training over the last 3 years so training is not as serious as it was 10 years ago. The body is not quite willing any more. There is no set pattern to my training now. These days it consists of runs in the local woods that I have run in for 33 years. Usually 6/7miles steady. Fartlek and speed sessions with the MRR. I also try to fit in dreaded hills reps that I know have to be done! The Editor added the following. George Sim is renowned for being an elegant, graceful athlete who makes nearly all of the rest of us look bad by comparison! He has a great deal of talent and, as his training above shows, worked hard and intelligently to carve out a very successful running career. In addition, he has always been modest and extremely casual about his many successes. 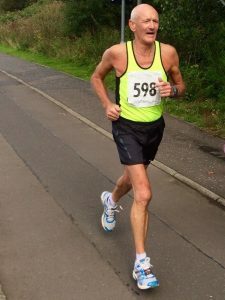 When we first met in 1990, before the Scottish Veterans Cross Country Championships in Dumfries, I knew that my Aberdeen AAC clubmate Graham Milne (a former Scottish marathon international) had been training with George and rated him as extremely promising. Graham lived in Elgin and had convinced George, a near neighbour, to join AAAC since we had a good veteran team. George made an immediate impact by finishing 7th and we won team gold medals for the third year in a row. George had just turned 40, having started running five years earlier. I was running quite well by 15 and so for a while, due to more background, had the edge on my new clubmate, who is more than two years less old. However his improvement was rapid – in fact it took him little more than three years to relegate me to the also-rans. A few significant races illustrate this process: a ‘Veterans’ Mile’ in July 1991 on the posh Aberdeen track, when George was right behind me with half a lap to go but I tried extra hard while he glided in just behind my 4.38.8; a month later he thumped me in the Aberdeen Half Marathon; then the 1992 Scottish Vets Cross Country in Troon when I got some revenge by finishing second to his fourth and AAAC won the team title again; the 1992 Alloa to Twechar 8-Man Relay when team victory was almost assured because George rolled right away from Fife AC on Stage Six (the great Don Macgregor was impressed, saying ‘A classy runner’); in late 1992 I finished a couple of places ahead in the Forres 6. The last time I managed to beat him was in August 1993 when I almost gave myself a heart attack in the Aberdeen Half Marathon, eventually finishing five seconds ahead of George, with Shetland’s Bill Adams another seven seconds down. This three-way battle was for the SAF veteran gold medal at that distance. By 1994 the contest was over for me: George Sim was different class. I could only admire the stylish supremacy of such an athlete and make the most of races when he was in a younger age group or running elsewhere! In his answers to the questionnaire, George did not mention title successes in the Scottish Masters XC: gold medals at M45 (1996), M50 (2003), M55 (2007) and M60 (2010). He did not run the British and Irish International until 1995 in Dublin, when he was 5th M45. By 2016 he had run for Scotland nine times in this most prestigious of events; winning many team medals (including M55 gold in Belfast 2007); plus individual M50 bronze in 2002; three silver (M50 in 2000, M55 in 2005 and 2007) and two fourth places as well. Yes, England’s Mike Hager (a frequent record-breaking World Veteran champion, after all) often had a slight edge on him but justice was served when, in Falkirk 2006, George Sim won the M55 age group. It was good that, despite many injuries, George was fit enough to be part of our M65 outfit in the 2016 Glasgow International, contributing to team bronze. Hopefully he will regain full fitness and go on to further fully-deserved successes.